It’s often said the beauty lies in symmetry and elegant lines. Rather like the pleasing form of an attractive body. The atomic structures of proteins are full of detail that obscures their overall form. Molecular biologists use cartoon renderings of them to see the larger form of the protein more clearly. 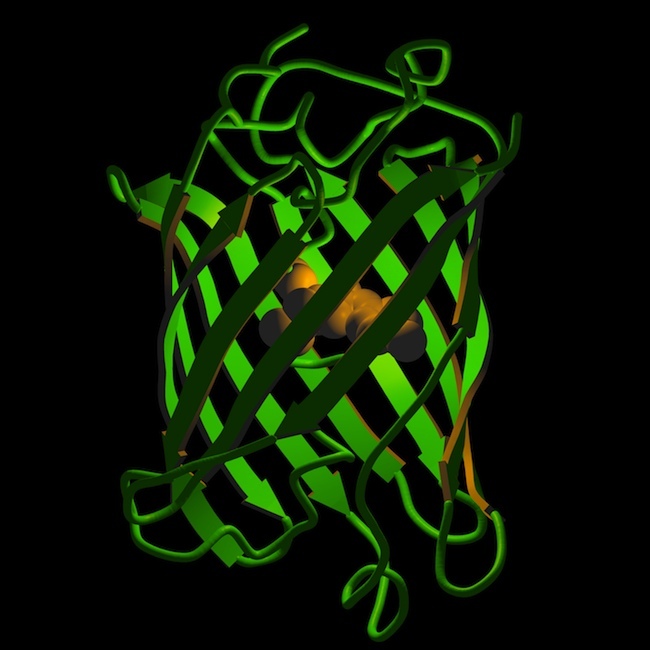 Using a cartoon we can see that the green fluorescent protein is a classic Î²-barrel protein–you can see the barrel shape formed from Î²-strands in the cartoon–with a chromopore embedded in the middle (this is the chemical that fluoresces). Green fluorescent protein–GFP for short–is a work-horse of cell biology. When UV light is shined on a sample containing GFP, it glows. Refined versions of the original proteins, more useful for practical use, won it’s inventors the Nobel Prize for Chemistry in 2008. Originally isolated from the jellyfish A. victoria, there are now many variants of GFP that glow in different colours (fluoresce at different wavelengths). 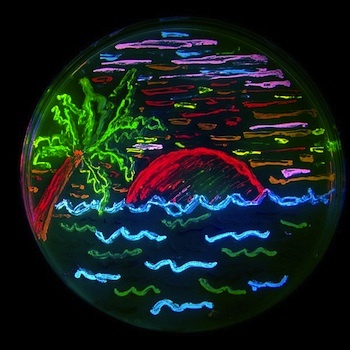 The beach scene to the left is ’drawn’ on an agar plate (or petri dish, named after Julius Petri) using live bacteria with genes for eight different variants of green fluorescent protein, each glowing a different colour. A lot of work in science is visualising what cannot be easily seen directly. 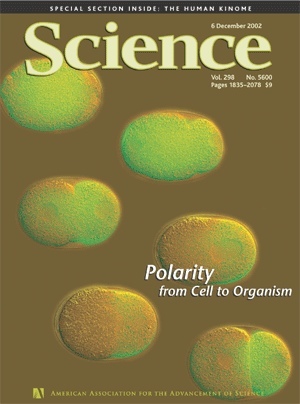 The C. elegans polarity regulator PAR-2, tagged with GFP, is found throughout a one-cell embryo (top left) but mostly in the posterior before the first cell division (bottom right). One common use of GFP is to make a modified version of a gene a researcher is interested in, tacking GFP onto it, a fusion gene with original gene and the gene for GFP as one larger gene. By shining UV light on the sample, researchers can see where the fusion gene is being used and where the fusion protein (what the gene codes for) is. Another approach is to chemically ‘tag’ an already-made protein with GFP. Learning how a body develops from a single fertilised egg cell is a huge task. One thing that happens in a growing body is that cells–by various means–learn what kind of cell they are. Here GFP shows that the PAR-2 protein is found throughout the single-cell embryo, but only the back (posterior) half of a two-cell embryo. At the two-cell stage, the amount of the PAR-2 protein reflects if the cell is a ‘front’ or ‘back’ cell of the embryo. Excuse the lack of photo credits, but the Science magazine legend doesn’t come with any either. What aspects of biology need to be explained better? Have a browse through the site and be amazed.